The government has pledged to strengthen its partnership with the Ismaili community in the country. “Shia Ismaili Muslims gather today in Canada and around the world to celebrate the diamond jubilee of their 49th hereditary Imam and spiritual leader, His Highness Prince Karim Aga Khan IV. “Since becoming Imam in 1957, the Aga Khan has used his role to advance global humanitarian causes, helping to support sustainable development and poverty reduction projects and enhance civil society and education around the world. “His spirit of cooperation also led the Aga Khan to establish, in 2006, the Global Centre for Pluralism, in partnership with the Government of Canada, and to choose Ottawa as its headquarters. In recognition of his commitment to diversity and pluralism and his many humanitarian efforts on behalf of people around the world, the Government of Canada made His Highness an honorary Canadian citizen in 2009. The government, the commercial sector and civil society all have a responsibility to create an environment of interacting forces coming together for development. Political stability; safety and security; citizen rights; predictable democratic practices; and an efficient, impartial legal and administrative framework are imperative. Civil society has to be active to complement the other sectors. Today is an occasion for celebration for the more than 15 million Ismaili Muslims around the world. It is the 60th anniversary of Prince Karim al-Hussaini assuming leadership of the Shia Ismaili Muslims and the title of Aga Khan IV. He is a direct descendant of the Prophet Muhammad and well-known as a wealthy horse breeder who helped save the historic French horse racing grounds Hippodrome de Chantilly. Media often compare the Aga Khan to the Pope because of his role of spiritual leader for Ismailis. The multi-billion dollar development network he founded and still directs is rarely mentioned. The global development projects under his purview are so vast that the comparison would be more accurate only if the Pope ran the World Bank, led agencies of the United Nations — and was the CEO of Berkshire Hathaway at the same time. The Aga Khan Development Network (AKDN), as it is called, spent more than $925 million last year on social programs, making it as big as well known NGOs like World Vision, Save the Children and Oxfam. And then there are the investments in hotels, electricity companies, financial services, media and tourism promotion that bring in $4.1 billion in annual revenue. The profits from the investments and the millions of dollars donated by Ismaili Muslims each year all go back into paying for AKDN’s work. The Aga Khan, spiritual leader of the Ismaili branch of Shia Islam, is opening a year-long jubilee to mark his 60th anniversary leading the community with a call on Tuesday for greater respect for pluralism in the Islamic world and action to reduce poverty. Among Muslim leaders, the Aga Khan holds a unique position. The community he leads as "imam" is not large – around 20 million adherents, compared to the estimates of several hundred million followers of Shia Islam's main branch, known as the "Twelvers." Sunnis make up the majority of the approximately 1.5 billion Muslims around the world. 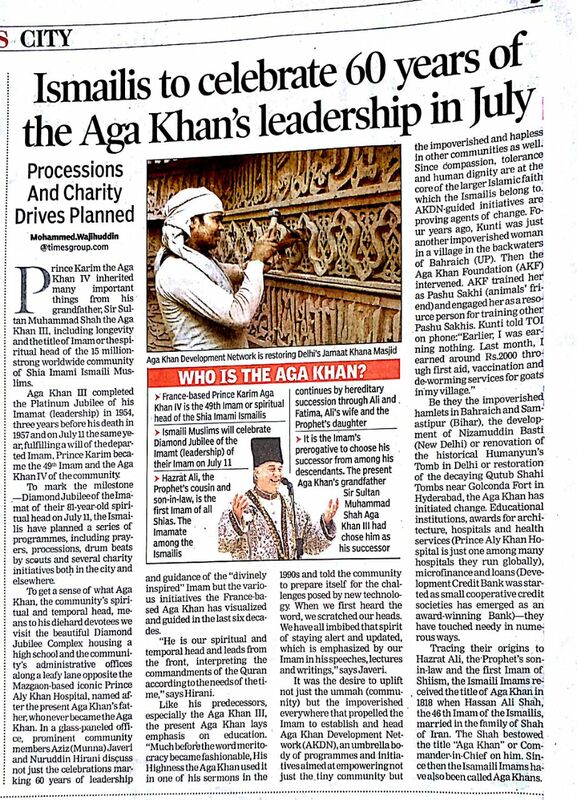 But while other Islamic communities have a fragmented leadership, the 80-year-old, Paris-based Aga Khan is accepted across the Nazari Ismaili community as the "imam", or spiritual head, giving him a singular status. His voice is amplified by his wide-scale development programmes, funded from his immense wealth and contributions from Ismailis, who are mainly centred in South and Central Asia but have significant communities in Africa and a small presence in Syria and Lebanon. The Aga Khan Development Network operates in 30 countries, leading health, education and infrastructure programmes. Throughout the Diamond Jubilee year that began on Tuesday, the Aga Khan will travel to countries where the network operates to launch new programmes to alleviate poverty and increase access to financing for housing, education and childhood development, the network said. Born Prince Karim al-Husseini in Geneva, he succeeded his grandfather as Aga Khan on 11 June 1957, at the age of 20. He is the 49th Ismaili imam, a line that traces itself back to Islam's prophet, Muhammad. It is part of the mandate of the imam to "try to contribute to improving the quality of life of the community and those among whom the community lives," the Aga Khan told reporters ahead of the jubilee. He said Muslims should work on building an "empathetic, welcoming, peaceful and generous" society, which he called "a fundamental ethic of our faith." "All those are ethical principles of our faith, they're very clear," he said. "So it's really a question of how we put those principles in place in governance and civil society." "The focus should be on building quality of life and pluralism – meaning "equity toward all people and backgrounds," he added. Muslim countries "have been pluralist for many centuries," but various forces, including colonialism, have separated them by ethnic groups and sect, he said. One Jamat Diamond Jubilee images from India. One Jamat Diamond Jubilee images from Pakistan. Today, millions of Shia Ismaili Muslims around the world, including thousands in Canada, are marking a historic occasion as they celebrate the Diamond Jubilee (60th anniversary) of His Highness the Aga Khan. On July 11, 1957, at the age of 20, Prince Karim Aga Khan succeeded his late grandfather as 49th hereditary Imam of the Shia Ismaili Muslims, becoming the spiritual leader of the community’s now 15 million followers across 25 countries around the world. While the majority of Ismailis live in Asia and Africa, there is a sizeable community in Canada, estimated at over 100,000. This diaspora dates back to the early 1970s when dictator Idi Amin came into power as Ugandan President and ordered the expulsion of Asian residents, including Hindus and Muslims. Thousands of residents were told to pack up and leave Uganda, given 90 days to exit the country. It was then that the Aga Khan called then Canadian Prime Minister and longtime friend, Pierre Trudeau, asking for help. Canada opened its doors to thousands of Ismailis, the first time the nation had accepted such a large group of non-European refugees. Today, Ismaili Muslims across Canada and around the world reaffirm their spiritual allegiance to their Imam and renew their commitment to their faith. Imamat Day, also known as Khushiali, commemorates the anniversary of the accession of His Highness Prince Karim Aga Khan as spiritual leader, or Imam, of Ismaili Shi’a Muslims. His Highness succeeded his grandfather, the Aga Khan III, on July 11, 1957, and has devoted himself to the spiritual and worldly progress of Ismailis for 60 years. The Aga Khan is also renowned worldwide for his tremendous contributions in the field of international development and promoting global pluralism. We are proud to count him as one of Canada's honourary citizens. Canada is home to approximately 100,000 Ismailis, with the first arriving from Uganda in the 1970s. Since then, the Ismaili-Canadian community has grown and thrived, making significant contributions in all spheres of Canadian society, including politics, journalism, the arts and commerce. Diversity and inclusion are at the heart of Canada’s heritage and identity. As we celebrate Canada 150, it is the perfect time to recognize the many communities that enrich and strengthen Canadian society. As Minister of Canadian Heritage and Minister responsible for Multiculturalism, I would like to extend warmest Imamat Day wishes to Ismaili Muslims across Canada. Khushiali Mubarak! ISLAMABAD: President Mamnoon Hussain congratulated Prince Karim Aga Khan on the diamond jubilee of his ‘Imamat’ of the Ismaili community. He said Pakistan considered him a great friend, a patron and an ardent supporter of the cause of sustainable development. The president appreciated Prince Karim Aga Khan’s vision for development work in Pakistan, including projects with social, cultural and economic dimensions, a press release Tuesday said. (In Urdu) journalist Mubashir Zaidi, Dawn Magazine editor Muhammad Zarrar Khuhro, and BBC Urdu columnist Wusat Ullah Khan discuss the achievements of Ismaili Imams, Ismaili community, and their social and welfare achievements in improving the quality of life. The Aga Khan IV, Prince Karim al-Husayni, the religious head of of the Ismaili Shia Imamat, celebrated the diamond jubilee year of his leadership earlier this week with the launch of many development projects. What is not very well known is that Bombay was a centre for the consolidation of the community and its religious leaders’ influence. “On behalf of the City of Mississauga and Members of Council, we join with our local Shia Ismaili Muslim community to mark the historic diamond jubilee of the 49th hereditary Imam and spiritual leader, His Highness Prince Karim Aga Khan IV. Gouvieux, France -- His Highness the Aga Khan commenced his Diamond Jubilee, or 60th year as the 49th hereditary Imam (spiritual leader) of the world’s Shia Ismaili Muslims. This worldwide celebration brings together the global Ismaili community, partners of the Aga Khan Development Network (AKDN), and government and faith community leaders in over 25 countries. It also commences a year of milestone announcements by the Aga Khan for a global commitment to partnerships based on the principles of ethics in action, peace and pluralism. “During the Jubilee year and in the future, poverty alleviation will continue to be a primary area of focus for my Jamat and all the AKDN institutions,” said the Aga Khan in an address to the global Ismaili community. The Aga Khan emphasised Diamond Jubilee priorities, including the promotion of early childhood and primary education, strengthening institutions, and invigorating civil society. He thanked partners of the AKDN for their continued contributions. Over the past six decades, the Aga Khan has transformed the quality of life for millions of people around the world. In the areas of health, education, cultural revitalisation, and economic empowerment, he has worked to inspire excellence and improve living conditions and opportunities including in some of the world’s most remote and troubled regions. Following in the tradition of his forefathers—going back over a thousand years to the establishment, by the Ismaili Imams, of the earliest universities and institutions of learning in the Muslim world—the Aga Khan has continued to emphasise the importance of education for both men and women. He has established centres of learning that are at the forefront of international teaching practice, knowledge and scientific research, including the Aga Khan University, the University of Central Asia, and the Aga Khan Academies. The Aga Khan is a direct descendant of the Prophet Muhammad (peace be upon him and his family) through his cousin and son-in-law Ali, the first Imam, and his wife Fatima, the Prophet’s daughter. He succeeded his grandfather, Sir Sultan Mahomed Shah Aga Khan as the Imam of the Shia Ismaili Muslims sixty years ago, at the age of 20. Today, His Highness the Aga Khan leads a global community of some 15 million Shia Ismaili Muslims, living predominantly in South Asia, Central Asia, Africa, the Middle East, Europe, North America, and the Far East. Like the Muslim world as a whole, the Ismaili community represents a rich diversity of cultures, languages, and nationalities. His role as Imam includes the interpretation of the faith for his community and responsibility for religious institutions and his followers worldwide. Driven by the ethics of his faith and the Imam’s hereditary responsibility to improve the quality of life for his community and for those amongst whom they live, the Aga Khan has been at the forefront of innovation in development during his 60 years as Imam. He is Founder and Chairman of the Aga Khan Development Network (AKDN), one of the most comprehensive development networks in the world today. The AKDN operates in over 30 countries principally in Central and South Asia, Eastern and Western Africa and the Middle East. Its activities contribute to the employment of over 80,000 staff, making one of the largest development organisations in the world. Inspired by the Islamic ethic of compassion and responsibility to care for the needy, the AKDN works for the common good of all citizens, regardless of their gender, origin, or religion. The AKDN’s agencies have mandates ranging from health and education to architecture, microfinance, disaster reduction, rural development, the promotion of private-sector enterprise and the revitalisation of historic cities—all of which are catalysts for development. Together, they contribute towards building a vibrant civil society that addresses the needs of vulnerable populations. AKDN spends US$ 925 million dollars annually on non-profit social and cultural development activities – a threefold increase over the past ten years. It operates more than 200 health care institutions, 2 universities spanning 6 countries, and 200 schools and school improvement programmes in some of the most remote and poorest parts of the developing world. At the same time, AKDN operates over 90 project companies in post-conflict and transitional economies, helping to lay the foundations of economic development in these countries. These companies, which range from a large-scale hydropower project in Uganda to a mobile phone company in Afghanistan, now generate over US$ 4.1 billion in revenues. Surpluses from these activities are re-invested into development projects. Each year, among numerous other interventions, the AKDN provides quality health care to five million people, improves teaching for two million students from preschool to university level, generates electricity for ten million people, and helps eight million to achieve greater food security, raise household incomes, and improve their overall quality of life. In keeping with tradition, the Aga Khan’s Diamond Jubilee celebrations will include the launching of new social, cultural, and economic development projects. New projects and initiatives to be announced or dedicated this year include coordinated programmes to alleviate poverty, increased access to finance for education, health and housing, early childhood development, and infrastructure (principally, water, energy and telecommunications) projects in developing countries. Additional resources and capacity will be added to the institutions of the AKDN, including the Aga Khan University and the University of Central Asia. The Aga Khan believes diversity should inspire, not divide, and that enhancing pluralism is a crucial building block for constructing peaceful and successful societies. In 2006, the Aga Khan and the Canadian government established the Global Centre for Pluralism in Ottawa to conduct research and advance knowledge about the values that underpin inclusive pluralistic societies. The Aga Khan has enhanced dialogue and fostered collaboration between faith communities and has been a strong advocate for an improved understanding of Islam. He has emphasised Islam as a thinking, spiritual faith that teaches compassion and tolerance and upholds the dignity of mankind. Rejecting the notion of an inevitable conflict between peoples, he has called this a “clash of ignorance” rather than one of civilisations. The Diamond Jubilee provides an occasion to improve understanding – including of Islam and Muslim civilizations - and foster collaboration between different peoples and faith communities across the globe. Foreign Minister AH Mahmood Ali has praised the Shia Ismaili community’s spiritual leader Prince Karim Aga Khan for his global role. He spoke at a reception celebrating the diamond jubilee of the Aga Khan as the 49th hereditary Imam (spiritual leader) of the world’s Shia Ismaili Muslims in Dhaka on Thursday . Ali said like his grandfather, he focused on efforts concerning the well-being of his own community and the wider Muslims as well. “The Aga Khan’s work is underpinned by an emphasis on Islam as a spiritual faith which cherishes the role of the intellect, teaches compassion and tolerance, and upholds the dignity of humankind”. He also praised the role of the Aga Khan Development Network in Bangladesh and said the network is committed to enhancing its investments in the education sector with the establishment of the Aga Khan Academy Dhaka which is to be located on approximately 20 acres of Network-owned land in Bashundhara. The academy will be comprised of world-class facilities and become part of an integrated network of 18 such academies being built globally. The Shia Ismaili community organised the reception at a Dhaka hotel. The Aga Khan is a direct descendant of the Prophet Muhammad (peace be upon him) through his cousin and son-in-law Ali, the first Imam, and his wife Fatima, the Prophet’s daughter. At the age of 20, he succeeded his grandfather, Sir Sultan Mahomed Shah Aga Khan as the Imam of the Shia Ismaili Muslims 60 years ago. Today, the Aga Khan leads a global community of some 15 million Shia Ismaili Muslims, living predominantly in South Asia, Central Asia, Africa, the Middle East, Europe, North America, and the Far East. July 11 marks the day of his accession to the Ismaili leadership. Le leader spirituel de 15 millions d’Ismaéliens, musulmans chiites pacifiques, désigné à l’été 1957 par son grand-père l’Aga Khan III, a, depuis, tracé sa voie. S’appuyant sur ses principes religieux qui impliquent d’améliorer la vie des siens et des populations locales, le prince a transformé l’existence de millions de gens, notamment dans les régions les plus reculées ou instables de la planète. A travers son solide réseau de développement social, l’AKDN, l’imam visionnaire œuvre pour la santé, l’éducation, la prévention des catastrophes, l’autonomisation économique, le microfinancement, la culture…, avec un trésor de 925 millions de dollars par an dont les dividendes sont réinvestis dans leurs activités propres. Une entité intervenant dans plus de 30 pays, en Asie centrale, en Asie du Sud, en Afrique orientale et occidentale et au Moyen-Orient. Fidèle à la tradition de ses ancêtres, le père de Zahra, Rahim, Hussain et Aly, grand seigneur, entretient néanmoins le mystère quand on lui demande qui sera son successeur à la tête de cet empire économique et confessionnel. De sa voix à l’inimitable tonalité orientale, il répond seulement que ses trois aînés ont déjà des responsabilités au sein de l’AKDN et ont grandi dans cette éthique… Côté flamboyant, à Chantilly, domaine dont il est l’un des mécènes, Son Altesse consacre de grands moyens à son écurie de course. Une passion familiale et une réussite personnelle, avec l’un des plus beaux élevages sur terre. Mais lorsqu’on le complimente sur le pluralisme de son action, bon prince, il explique&#8201;: «&#8201;J’ai favorisé le dialogue et la collaboration entre les communautés religieuses et beaucoup plaidé en faveur d’une meilleure compréhension de l’islam.&#8201;» Sans doute heureux d’avoir œuvré ainsi, l’Aga Khan n’en parle guère. C’est ça, la classe&#8201;! Who is the Aga Khan and why is his Diamond Jubilee being celebrated? The Aga Khan’s full title is His Highness Prince Karim Aga Khan IV. Although he is known as a man of few words, he is in fact the 49th and current spiritual leader of around 15 million Ismaili Muslims, who are scattered across 25 countries. While most Ismailis live in African and Asian countries – there are sizable communities in Britain as well as the US and Canada. 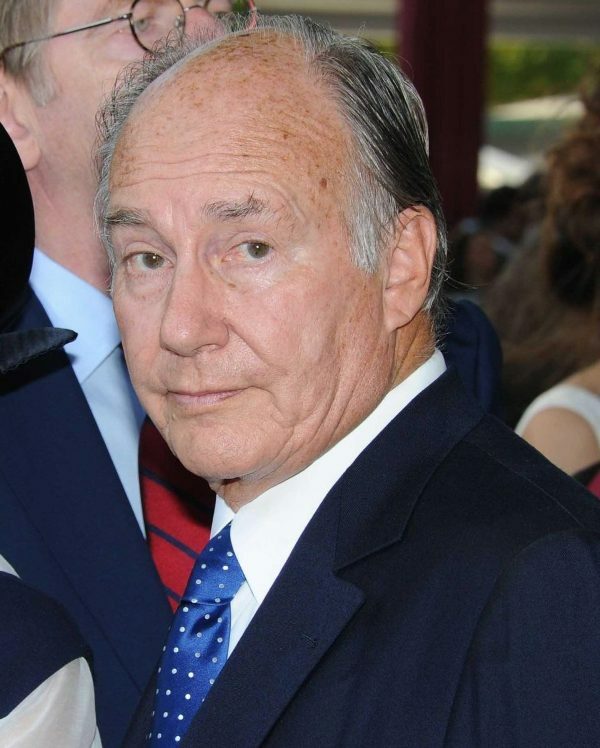 The Aga Khan has a British passport but he lives in France and is among the top 15 of the world’s wealthiest royals. According to Forbes magazine, he’s worth an incredible £800 million. He assumed the role of the 49th Imam (or spiritual leader) of the Shia Imami Ismailis on July 11 1957 at the age of 20 – succeeding his grandfather, Sir Sultan Mahomed Shah. When this happened, he was in his junior year at Harvard and it was the first time in the family’s 1,300-year history that a generation had been skipped over. What is his Diamond Jubilee all about? In 2017, the Aga Khan began his Diamond Jubilee year – that is, the completion of 60 years at the helm of the Ismaili community. The last 11 months have seen countless celebration, festivities and the launch of dozens of new projects in his honour that will go on to benefit not just the Ismailis, but every man, woman and child worldwide, regardless of their creed, colour, background or financial standing. The Diamond Jubilee year is effectively a celebration of the Aga Khan’s vision and tireless work, which has steered the Ismaili community through six decades of sweeping changes in the global landscape. These changes have been on a scale that is unprecedented in history and during a period which has seen massive social, political and economic challenges. The 81-year-old is also currently on a worldwide ‘tour’ where he is personally meeting as many of his followers as he is able, and using each visit to launch a Diamond Jubilee legacy project that will live on for generations. Is the Aga Khan visiting the UK soon? The humble leader is due to visit the United Kingdom at the end of June where he will spend two days meeting the British Ismaili community in private gatherings. During his time in the UK, he will personally open the Aga Khan Centre in London’s thriving ‘Knowledge Quarter’ at King's Cross. The Aga Khan Centre has been designed by Maki and Associates and the project was led by Fumihiko Maki, one of Japan’s most distinguished contemporary architects. The centre will provide a new home for a number of UK based organisations founded by His Highness the Aga Khan. These include The Institute of Ismaili Studies (IIS), the Aga Khan University Institute for the Study of Muslim Civilisations (AKU-ISMC) and the Aga Khan Foundation UK (AKF UK). These Institutions have been operating in the UK for many years and are part of a mission and mandate to increase knowledge and understanding of Muslim civilisations and help improve the quality of life for people around the world. The Aga Khan Centre will also help connect the public to global development issues and the Aga Khan Foundation’s work to improve the quality of life for people of all faiths and backgrounds in some of the world’s most disadvantaged communities. The building will stand proudly alongside the new offices of Facebook and Google. Is the Aga Khan friends with the Queen? Her Majesty the Queen and Prince Karim are old friends, and it was the Monarch who bestowed the title of ‘His Highness’ on the Aga Khan in 1957 on his ‘Imamat’ – the year of his accession as hereditary leader of the Shi’a Ismaili Muslims. The Aga Khan holds a number of titles and honours worldwide, and was most notably appointed Knight Commander of the Most Excellent Order of the British Empire in 2004. In March 2018, Queen Elizabeth hosted the Aga Khan and his family at Windsor Castle to celebrate his Diamond Jubilee. In attendance were a number of members of the Royal Family, including The Prince of Wales and The Duchess of Cornwall, The Duke of York, The Princess Royal and Vice Admiral Sir Tim Laurence. 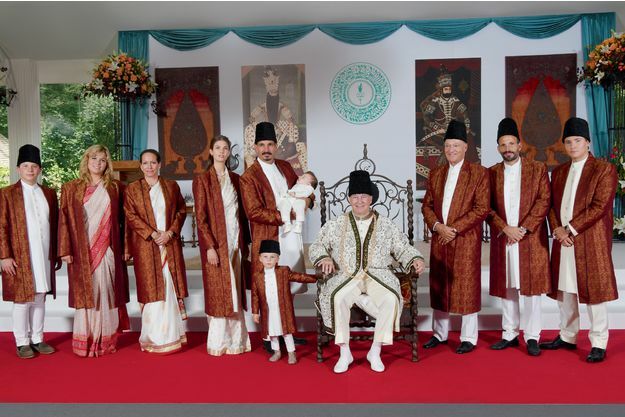 The event acknowledged historic linkages between the Ismaili Imamat and the British Monarchy and longstanding connections between the Ismaili Community, the institutions of the Aga Khan Development Network and the United Kingdom. What is the Aga Khan Development Network? The staggeringly large Aga Khan Development Network (AKDN) works across 30 countries around the world, and employs 80,000 people. It was established to improve the quality of life not just for Ismailis, but also for the wider communities in which they lived. For over 60 years, the AKDN has been building institutions and delivering essential services by creating schools and hospitals, newspapers and electricity generation plants, and social programmes of all kinds. The collective agencies work towards multiple causes – these include the elimination of global poverty and the advancement of the status of women, among others. Worldwide, the Aga Khan’s name can be seen on a number of hospitals, schools and universities – each facility employing, assisting, treating and educating without discrimination.